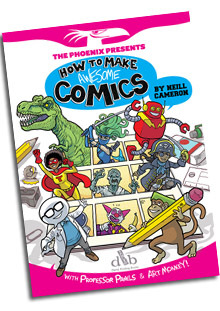 See more Dinosaurs over at Super Comics Adventure Squad! Here is another DFC strip idea I kept meaning to get around to... or more accurately, threatening Editor Ben with. VAMPANDA! Dave Van Helsing, second-cousin-twice-removed of the famous vampire hunter, has no idea of his family's unusual legacy, and has set up in business as the proprietor of a small garden centre. But a dark shadow haunts its aisles and tea shop... the shadow of the VAMPANDA! 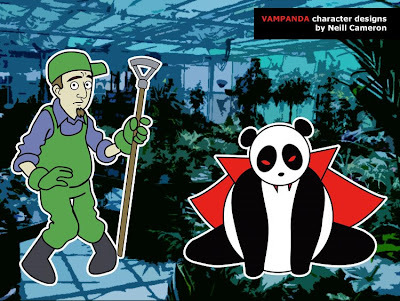 It's a fairly straightforward Roadrunner / Wile E. Coyote set-up: Vampanda wants to eat the garden centre's bamboo, Dave wants to stop him. And, using the full range of his evil vampiric powers- blood-sucking, shape-shifting, flight, mind control - Vampanda always wins. 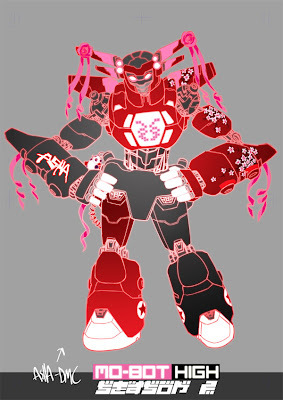 I got myself into a bit of a metaphysical conundrum though, as Vampanda exists in the fictional universe of Mo-Bot High as Asha's favourite cartoon, so I - the creator of that universe - could not logically exist within it as the creator of Vampanda. I was considering producing the strip using a pseudonym so as to circumvent this tricky ontological quandary, when I realised that I was just massively MASSIVELY overthinking things, and went and had a nice lie down instead. 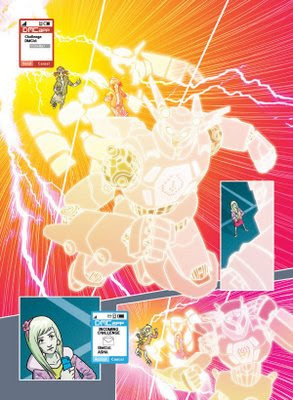 Go Go Super Comics Adventure Squad YEAH! So the last-ever-for-now issue of the DFC came last Friday. I'd been putting off blogging about it until the end came, and now that it has... I still don't feel like blogging about it. So there. Many of the other creators involved have written beautifully on the subject already, and I don't really feel I have much to add. 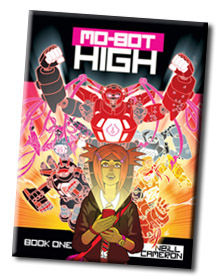 I'll just briefly say that getting the chance to write and draw Mo-Bot High really was a dream come true for me, and I'm enormously grateful to have been given the opportunity. 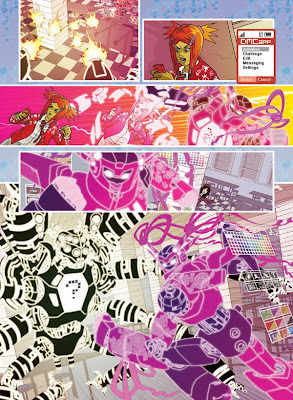 I'll also briefly say that working with Ben Sharpe, Will Fickling and David Fickling in developing the strip was absolutely the best professional experience of my career in comics so far, and I learned a huge amount about writing and storytelling from them that I'm also hugely grateful for. 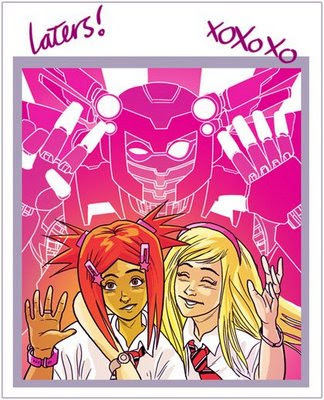 Okay, and I'll ALSO briefly say that all the letters and bits of Mo-Bot fan art that I received made me happier than I can easily describe, and a couple of them (including a 'Happy Mo-Bot Christmas' card from one reader) are now amongst my most treasured possessions, which I am - again - incredibly grateful for. I have no doubts that many of the strips from the DFC will live again in some form or another, and I include Mo-Bot High in that optimistic outlook. I have huge amounts of story still to tell with the characters and you can be absolutely certain that I'll get to it one way or another. Just as soon as the details about how that's going to happen have been sorted out, I will be sure to share them with you. In the meantime, go check out Super Comics Adventure Squad, your brand-new one-stop shop for keeping up with what all your favourite DFC creators are up to! 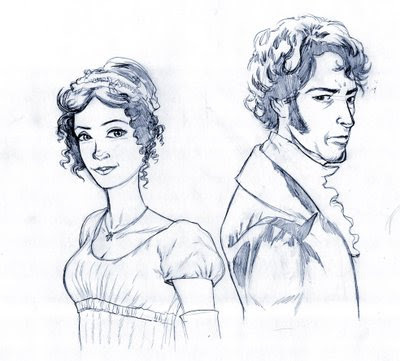 I saw the other day that Marvel are publishing a comic-book adaptation of Pride and Prejudice, which boggles my mind for many reasons, not least of which is the sheer cosmic injustice that I don't get to draw it. 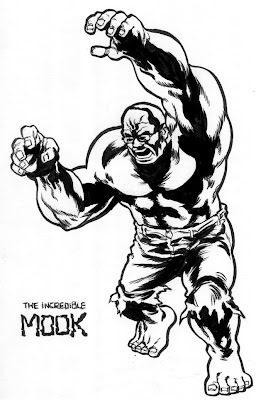 Hey Marvel! If you're ever doing Persuasion, GIVE ME A CALL. 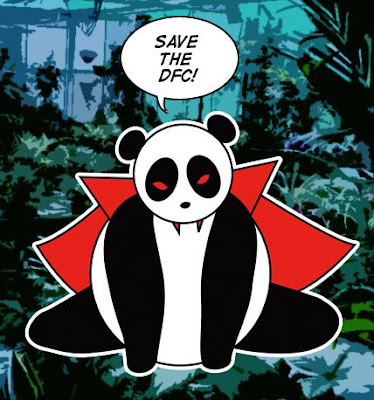 Someone has started a Save The DFC campaign! I find this tremendously cool. Go see the blog! Tell your friends! etc. Meet... 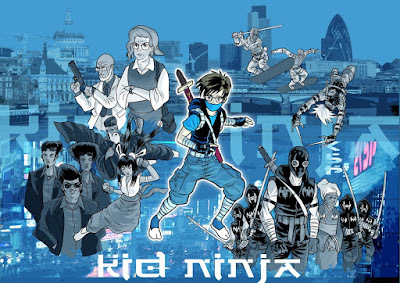 KID NINJA! Can you guess what his deal is? 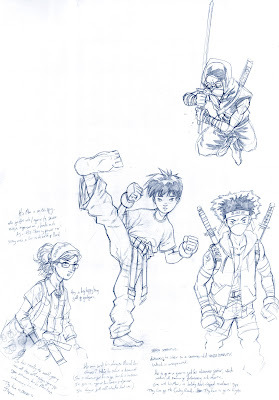 He is a kid, who is a ninja! 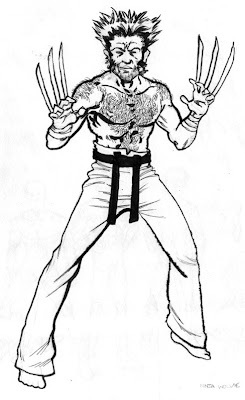 Can you believe they didn't go for a high concept like that? 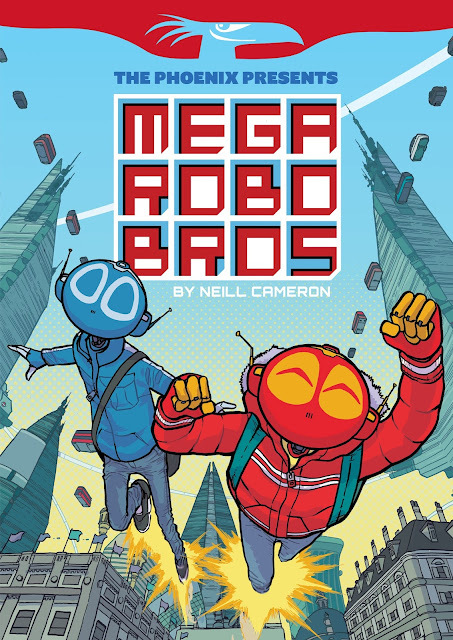 Admittedly, it perhaps was not the world's most original concept on paper, but there was some character and story stuff in the pitch that I really liked and will no doubt end up using somewhere, one day! 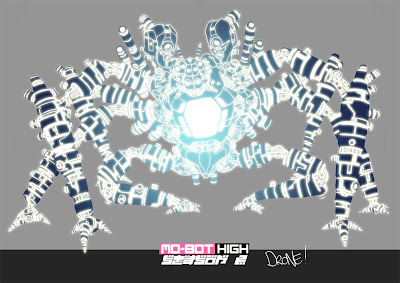 I've just updated www.neillcameron.com with a bunch of new stuff, including some art from Season 2 of Mo-Bot High. Please do go and have a look! I feel like the second season was kind of where I hit my stride on the strip. The above page, for example, I'd say I'm actually about 90% happy with, which is a new personal best! 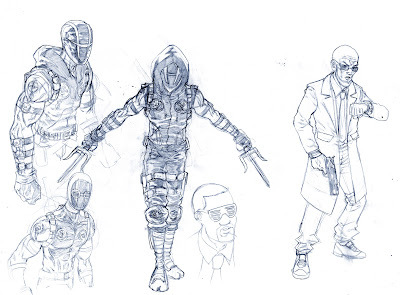 There's also a new 'character design' section on the website. See if you can guess what's in there. I haven't said much here about recent developments with the DFC. Just can't seem to bring myself to type what would probably be a rather downbeat and heartbroken whine. In any case, it has all been covered more eloquently elsewhere. But all is not lost, kiddies. And that is all I will say for now. Here as a break from all the wearyingly monochromatic sketchbook scans is a bit of actual finished work. 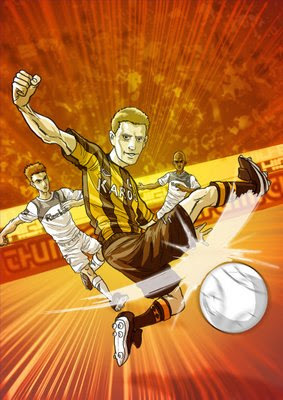 Magazine illustration to accompany an interview with footballer Andy Dawson. 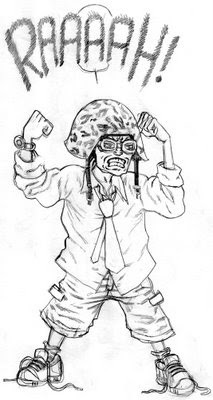 The brief was for a portrait in a "Roy of the Rovers meets Manga" style. I'm not a big football fan but I do really enjoy drawing footballers - they have the same sort of appeal as superheroes I guess, but with the added bonus of wearing actual clothes, which means lots of dynamic wrinkles and drapery, which is one of my favourite things to draw. I can only assume this was some kind of psychological self-portrait. 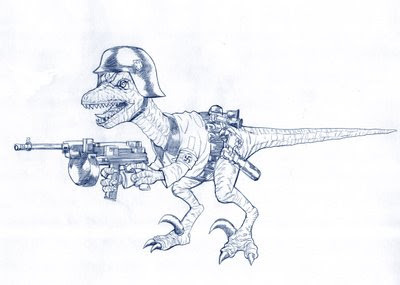 This was part of an idea for a comic called Political Creatures which I did some art for, written by Internet Comics Rumourmonger Supreme (that is his offical title) Rich Johnston. It never actually got further than concept art and a few sample pages, but we got to go on telly talking about it anyway. 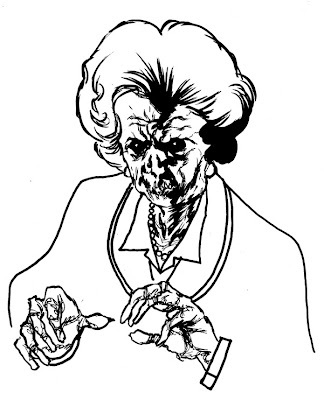 This proves, if nothing else, that "Zombie Margaret Thatcher wants BRAAAAAIIIINNNNNSSS" is a pretty media-friendly high concept. 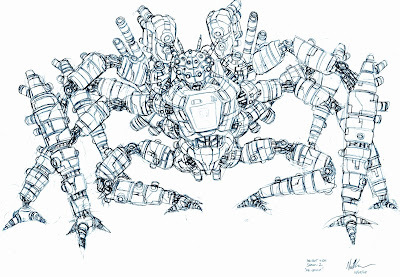 Sketchbook Scan #0009: GIANT ROBOT SPIDER! Drawn in a very pleasant park in Melbourne, IIRC.